Tonight’s tasting is the final release that completes the Trade Route Series which is only available to Travel Retail outlets, at $159.00 for a 1 litre bottle. 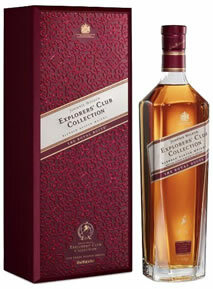 JOHNNIE WALKER, unveiled the jewel in the crown of its new and exclusive range, the JOHNNIE WALKER EXPLORERS’ CLUB COLLECTION – THE ROYAL ROUTE. This luxury blend completes the first Series of the collection – the Trade Routes Series. JOHNNIE WALKER EXPLORERS’ CLUB COLLECTION – THE ROYAL ROUTE is inspired by the majestic history and the sights of the royal trading route, famed for bringing the luxuries of the world to the hands of Kings. The travellers’ tales of the legendary journeys that took place on this road, the precious silks, Persian ornaments, diamonds and pearls that were traded along it, inspired today’s Master Blender to create the most opulent variant in the series. Blended harmoniously and carefully refined, the dark amber-hued whisky is sourced from the finest hand selected oak casks from the exclusive reserve cellars of JOHNNIE WALKER. 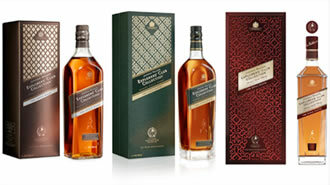 Johnnie Walker brand owned by Diageo. Lets taste this final release. Nose…Ripe peaches, orchard fruits, the mildest hint of peat smoke. Taste…Halloween toffee apples, mixed dried fruits, ultra smooth, the smoke is ever so gentle, spiced oak and a little drying. Finish…Long and elegant finish, rich oak and smooth dark chocolate, ending with a whiff of delicate smoke. A grand De-Luxe blend and a fitting finale to the Trade Routes series, a superb and elegant dram and would grace anyone’s drinks tray. To be sipped with just a teardrop of water. The Whisky Boys on their next overseas trip will certainly be picking a litre or two of this outstanding blend, and so should all our readers. How on earth do you open the spice road collection?.